Think of this page as your field, where you can not only harvest relevant crop information from farmers like yourself, but plant helpful insights of your own. Q: What are things I should watch for applying potassium with a planter? A: If you are considering the application of potassium with your planter make sure it is accounted for when determining your “safe” rate of fertilization. For 2x2 applications, keep your total salt (nitrogen plus potassium) rate around 80 to 100 pounds per acre. For in-furrow applications, keep your total salt rate around 5 for coarse textured soil and 8 for heavy textured soils. Q: How much fertilizer can I apply without doing any damage to the seed or soil structure? Is there any sensitivity of seed with fertilizer that I should I be aware of if I apply fertilizer when planting? A: When considering any type of starter fertilizer application (whether it is 2x2 or in-furrow with the seed) we have two primary concerns – salt and ammonia. Salt is relatively easy to calculate. It is the sum of nitrogen and potassium that you plan to make per acre. The further away from the seed furrow the higher the salt application rate can be (see answer above for more info). Ammonia is toxic to germinating seeds at relatively low levels, so minimizing the exposure risk is key. Ideally, we would want to avoid urea-based in-furrow products. If urea-based products are going to be applied with the seed, the more acid the solution the better (decreases the chance of producing free ammonia). Also, avoid basic (alkaline) fertilizer materials being applied with the seed. The best example here is MAP (monoammonium phosphate) versus DAP (diammonium phosphate). Monoammonium phosphate creates a slightly acidic pH in solution when it dissolves, and DAP creates a slightly basic pH. DAP has a much higher risk of producing free ammonia than MAP, and is therefore a greater risk to the germinating seed. Q: How much should I be concerned about salt levels with starter fertilizers causing damage to my crop? A: Do consider the salt level of the starter material being evaluated. We have a way of determining the salt index of any fertilizer solution. The lower the salt index, the lower the risk of salt injury for the germinating seed. Obviously, rate is still a major consideration, but at equivalent rates, a lower salt index product is safer. Salt index is based upon the source material used to create the fertilizer liquid. Q: I’ve heard a lot of discussion about 2X2X2 placement of fertilizer in bands. Is there anything I should know if I try this approach? A: Banding is a good nutrient application method for two reasons: usually it means that fertilizer applications are made below the soil surface (not always the case though – surface banding of nitrogen as an example) decreasing the potential for loss via surface transport, and creating nutrient rich bands can slightly increase availability of the nutrient to the crop (not as much as is often reported). Q: How should I adjust my rates for banding placement? Does this approach make sense as a way to improve yields? A: Anytime we can place nutrients within the soil (specifically phosphorus and potassium), we decrease the potential for their loss. Thus, subsurface band application of fertilizer materials can be beneficial. Q: Some of the high yield winners are using this approach. Are there any other considerations I should think about when banding fertilizer? A: Creating nutrient rich zones may decrease soil fixation (important for phosphorus) leading to greater availability in the short-term. Historically, efficiency improvements were noted to be as high as 50% (so half as much fertilizer was required if banded), but more recent data has not shown similar effects (it is dependent upon soil test level). Something closer to 10 to 25% is more realistic. Do realize that long-term band applications will draw down soil test levels if they consistently occur at a level below crop removal. Q: Does it matter how close I apply N,P,K to the furrow? A: Care should be taken when making rate decisions for band applications, especially if the banding is occurring at or near planting time. The higher the nutrient application rate (just considering nitrogen and potassium), the further away the band should be from the seed furrow. The basic rule of thumb for 2x2 applications is to not exceed 80 to 100 pounds per acre (sum of nitrogen and potassium). The “safe” rate is related to soil texture. Heavier, fine textured soils can take higher rates, and coarser, sandier soils require lower rates. Q: Why did K levels go down in Fall 2016 when farmers were maintaining or building soil levels? A: You’re not the only one who has reported this phenomenon. I’ve heard this question several times in the last couple of years. While I would struggle to give you a clear reason for your particular scenario, I can share some potential causes of decreased soil test potassium where building has occurred. Let me first start with soil sampling strategy. I’m not sure what approach is being employed – grid, zone, grid/zone, etc., or the resolution of the sampling – 10 acres, 5 acres, 2.5 acres, etc. One thing I caution farmers and consultants about is the number of samples that are collected to represent the area of interest. Too few samples to constitute a composite (which commonly occurs at more intense sampling approaches) can have large potential errors. Essentially, the sampler is not collecting a large enough sample to get a good approximation of the mean (see our video on spatial variability). So make sure that you collect an adequate number of samples to get a good representation. Fall moisture patterns can also dramatically affect soil test potassium levels (assuming sampling occurs in the fall). If soil sampling occurs during a dry stretch, soil test potassium can be decreased (I have seen this myself in field research). Soil test potassium level tends to follow soil moisture. This may partly be explained by decreased residue breakdown during dry periods. Corn stover specifically contains a lot of potassium, but if that residue is not broken down due to limited moisture, less potassium is resupplied to the soil system. This can cause a lower-than-expected soil test level. Another potential issue is soil sampling depth. This is especially important in conservation tillage systems. Nutrients do stratify in conservation tillage approaches causing higher nutrient concentration at the soil surface. Inconsistent depth of sampling can lead to some really confusing results. Make certain that soil samples are collected to the appropriate depth. Soil potassium levels do change from one sampling season to another, and sometimes we cannot explain the source of the variation. I say this all the time – I am more interested in changes in soil test levels over a few years than over a single year. If you continue to see soil test levels declining (when you should be supplying enough to maintain/build) then something needs to be adjusted. The final thought would be – are fertilizer applications actually keeping up with nutrient removal? This can be easily tested by collecting random grain samples and determining the nutrient concentration for your crop (there are book numbers out there, but they are averages). Q: How much K is lost to runoff during rain or irrigation events? Specifically for a soil with a CEC equal to 10 milliequivalents/100g. A: There has been a lot of research on this related to nitrogen and phosphorus, but I am not aware of anything published on potassium. Let’s first agree that loss is only going to occur if the rainfall event creates surface runoff (the CEC in question is not low enough to be too concerned with leaching). I’m going to borrow from experiments where phosphorus from recent applications is exposed to a runoff event (using phosphorus as a proxy for potassium). The actual amount of phosphorus lost in these experiments is generally very low. As percentage of what is supplied, it is generally less than 5 percent (and sometimes much lower than 5 percent). I would assume the same for potassium. Just for reference, much of this research is done with rainfall simulators that are dumping a good amount of water over a short period of time. Recognized as a 4R advocate for his efforts to safeguard the environment through proper nutrient management, Dave Legvold is a great example of a grower looking to continually improve his operation. He has farmed near Northfield, Minn. for almost 40 years and worked with agriculture students as an educator and mentor to support the agriculture industry at large. His best piece of advice for a young farmer? Rely on your community resources. Not necessary financial, but the personal resources and the potential to build relationships and share wisdom that is out there. Years in business: This will be my 40th year of farming. I worked in education for 12 years before I got the itch to move back to the farm in my home community. We felt it would be a great place for our two young, strapping boys to give blood, break bones and raise hell. They fortunately turned out to be decent citizens in the world today — the farm was a great place for them. When I was in education, I made sure I developed programs to bring students to the farm. We had a week when over 350 students would visit the farm. It was very interesting because what I taught in environmental studies needed to square up with what my students saw on the farm. If they saw something that did not look like what I was teaching them, they would rat you out. It was a wonderful experience to have a living laboratory that the students could come take a look at. The journey to receive the 4R advocate award really started with me using the environmental tillage system machine called the Soil Warrior. I had used it for some years as a vehicle to manage my fertilizer, keep it in place, use the right rate and put it in the right spot. The company wanted to nominate a farmer for the 4R award. They interviewed me and my agronomist, Ken Thomas. Low and behold, I got a call and said I was a 4R advocate. It has been a fairly uneventful journey with lots of people doing lots of things to help this process along. There are a lot of people behind the scenes you need to express gratitude to for helping you. The 4R advocate position carries responsibility to speak to group of people including farmer and environmental groups to tell them what people in agriculture are doing to safeguard the environment through proper nutrient management. The public perception of agriculture in some areas is not very positive. There are certain hot button words that cause alarm or raised eyebrows. One of those is fertilizer. The perception is that farmers are out dousing their land. That upsets me, just the word dousing. That implies a willy-nilly approach of fertilizing your ground. So many times, farmers, agronomists and agency people end up talking among themselves. I think we need to do what we can to branch out and encounter the public with a positive message. What soil characteristics describe the majority of management zones on your farm? Where I am farming, we have somewhat rolling land. We have variable soil types. I farm land that goes everywhere from sand to dark peaty soils that are poorly drained. The majority of the land is a good loamy soil and is quite workable. It will hold nutrients because I’ve worked to build organic matter. I think the key to holding nutrients is having organic structure in the soil — I farm 800 acres of every kind of soil you can imagine, which means I have to vary my approach. Minnesota is blessed with a lot of water. We have a lot of streams. The streams are a great conduit of nutrients off the land. I have installed buffers on my properties and practice no-till and strip till so land always has a cover. It has also become apparent that we need to use cover crops. I am not very good at that, but we are working on it. My journey in farming started with the idealistic approach of that I would like to be an organic farmer producing alfalfa, small grains, corn and soybeans. I also had a beef herd. I soon learned that organic farming requires a great deal of tillage: fall tillage, spring tillage to keep weeds under control. With row crops you are using a cultivator; I found I was losing a great deal of my topsoil through erosion. It totally disaggregated the soil so it was loose and available for erosion. I looked at that and said this is not good — I will need to do something else. I then made the move to high residue farming. That is where I am today. Residue and old crop roots are dandy protectors of the soil. What are your primary sources of information for making decisions related to fertilizer use and nutrient management on your farm? I have a wonderful opportunity because the city we live close to is a two-college town, St. Olaf College and Carlton College. Both are very prestigious schools. Both have wonderful geology and environment studies programs in which students are interested in how agriculture is impacting the environment. I have mentored college students in their senior thesis or undergraduate project. Their research into soil aggregations, bulk density, nutrient retention, organic matter and porosity of the soil has informed me if what I&rsqui;m doing is the right thing. There is nothing more humbling then to do a nitrogen trial with a student, then have the student come tell me where we applied 300 pounds of nitrogen, you lost money on that. That’s really humbling. However, that is exactly the on-farm research we need. When we talk about the 4R project, I really wish it was the 5R program with the fifth R being research. My main source of information is on-farm research. I also have a great relationship with my agronomy provider, Ken Thomas at Farmers Mill and Elevator, in Castle Rock, Minn. Between those sources of information, we are getting close to perfect. Dr. Robert Mullen’s in-depth analysis of the 2015 soil test levels in North America issued by the International Plant Nutrition Institute (IPNI) reveals a decline in nutrient balance trends as more Minnesota soils test below the critical level for K and P. Given that information, what are you observing in your region of the state that conflicts with or supports that information? When I worked with a watershed organization that was associated with the Minnesota Pollution Control Agency, we worked with a grant project to study the amount of N, P, and K in 25 surface waters in southeast Minnesota. We went for the larger streams. We found the trend over the past three decades is for the P and K presence in surface waters to decline slightly. But, alarmingly, the amount of nitrogen has increased significantly. So, we have a great deal of N going into our waters. I think the reduction of tillage has a lot to say about keeping P and K on the land. But, nitrogen loves water. It will travel with water. Minnesota is a state where a lot of tiling is going on and has been done. I think taking a look of what we are doing with our nutrients has a significant impact soil quality, soil nutrient levels and what is happening with our surface waters. My experience is that we need to be doing something to manage the nitrate emissions, and keep on doing what we are to reduce tillage and eliminate travel of soil over land because that is how P and K get into our waters. I think up to a decade ago, agronomic publications and farm magazines were encouraging farmers to build fertility levels in their soil so you had high phosphate and potassium testing soils. I think now we can no longer afford to do that. We can address nutrient retention through tillage practices. We can address high crop production by placing the fertilizer properly so the crop can avail itself of the nutrients. For example, a strip till regime allows you to place the nutrient right where the crop is going to grow. What is the best part of being a farmer? There is a spiritual aspect of being a farmer. It is hard to quantify or describe because I think everyone’s soul is little different. One sunrise might be beautiful to you but not to me. What is the most important lesson you have learned as a farmer? Keep learning. Keep using good input from good people and I think you will do ok. I read Howard Buffett’s book “40 Chances: Finding Hope in a Hungry World.” He talks about farming as art, skill and just hard grunt work. He then asserts that every farmer gets 40 chances to get it right. Buffett says if you can get it right 40 times, you are doing pretty well. Guess what, this is my 40th year farming — I better get it together this year. I think the 4R system of thinking of my nutrients might help me get it right this year. What short piece of advice would you give to a new farmer? “We can’t do that,” they’ve said. Well, work in that direction so you are not sacrificing your soil. Don’t get addicted to lots of new, shiny paint. There are people who are metal magicians, and they can fix almost anything. Keep your old equipment in good shape. When you feel it is economically sustainable, buy something new. Go out in the country and get into somebody’s face you respect and ask them questions. Come back over and over. It has worked out well for these young farming families that I have been the old guy in the neighborhood for others. It is not uncommon for someone to drive into my yard at one in the morning, open up my shop, use my welder, do their welding project and then go away. It is that open and welcoming sense of community. So, I think advice to a young farmer or person going into agriculture is to rely on your community resources. Not necessary financial, but the personal resources that are there. Jim Isley has been farming for more than 40 years and is constantly making updates to improve his family’s 150-year-old farm. Some key practices on his farm include soil testing, on-farm trials and variable rate applications. 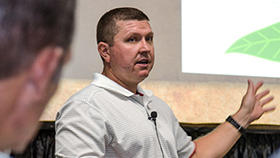 Isley believes sustainability can be profitable – hear his story to learn how nutrient management and conservation efforts can be combined to raise the best corn and soybean crop possible. A bit about your farm’s history: The farm has been in the family for over 150 years. I’m a fifth generation farmer. Years in business: I have been farming for over 40 years. Most of our 1,050 acre farm has a sandy loam soil with very coarse or gravelly subsoils. We are in the Lake Erie lake basin, so you get 6 to 8 feet below ground and you get into clay. In some ways, it is easy to grow a good crop, but they tend to be droughty. If you get a minor drought in summer, your crops can really be hurt. Conservation tillage has helped us. What is the best part of being a farmer, in your experience? The best part of being a farmer is coming to know long-term neighbors. We have neighbors that have been farming as long we have or my family has over the past 150 years. I used to be able to boast that I can name every house around us. It wasn’t a lot, maybe around 20 or better. Now that has changed. I have two sons and a daughter. One of my sons is involved with the farm. I hope for the best for them as they live in the community. I would start with the recommendations from our local supplier. We take a look at those. We look at the Tri-State Fertilizer Recommendations for the nutrient levels for our crops. We also look at the university studies and seed and fertilizer sales personnel for information. We do a lot of trials on our own farm. For example in 2016, we had 26 different trait packages. We do a lot of side-by-side comparisons on our own. Not only do we do variety comparisons, but we also conduct fertilizer rates and different fertilizer analysis trials. It almost becomes confusing. We run out of space on our farm for the trials. Dr. Robert Mullen’s in-depth analysis of the 2015 soil test levels in North America issued by the International Plant Nutrition Institute (IPNI) reveals a decline in nutrient balance trends as more Michigan soils test below the critical level for K and P. Given that information, what are you observing in your region of the state that conflicts with or supports that information? I can’t speak for soils on other farms, but on our own farm, we find that as yields increase, more nutrients are used by the crop and taken off the farm. We soil test half of our acreage every other year. We try to keep the nutrients in the respectable range. We have a battle with pH. We like to have our soils in the 6.0-6.5 range. For P and K, we apply whatever the nutrients call for. One of the goals for our farm is we want to apply all of our nutrients subsoil and variable rate, and we will achieve that this year. We also do strip till. My advice for any farmer is to soil test. It’s not that expensive. Considering the cost of nutrients, it is a bargain. Let’s find out what we have. Grow the best crop we can. The best crop does not mean applying more nutrients than necessary. On our farm, we had some phosphorus deficiencies years back. As I drive by my neighbor’s field, I can see some young corn that looks purple. I recognize what that is, but I’m not sure my neighbors recognize what that is. I really don’t want to go to my neighbor and say, “you should do this.” Sometime it’s easier with relatives or people you go to church with, but you don’t want to come across as knowing everything. I am sure they also see things in my crops that I’m not aware of. In the past ten years, the most important lesson I have learned is that sustainability and profitability can go hand and hand. As we face the challenge of moving forward with the increased conservation effort not only in our watershed, but state and nationwide as producers, we need to be conservation minded and apply nutrients where necessary, but at the proper levels. The two go hand in hand. Sustainability can be profitable. Keep an open mind to all the data we can collect, not only from your own farm, but also data from university studies and the data from other sources such as your fertilizer dealer or seed salesman. Do research on your own farm. We have had a yield monitor on our combine for a number of years. It was not until eight years ago; we pulled data out of that combine and viewed it as a map. It was very, very surprising. If you look at a field that yielded an average of 175 bushels; you find out, there is a lot of variability in a field. If those different variations in soil or in this case, yields were in separate fields, we would treat them differently. But they are not in separate fields; they are in the same field. Look at that. Use the knowledge and data we have available to us. Farm those fields or that field as they are different fields. We have found variable rate to be a very great thing. My father and grandfather practiced that on larger scale. Today’s technology allows us to farm that area on a sub-acre. Q: Are cover crops beneficial for yields? A: This is an often asked question that has mixed results in scientific literature. There is geographic specificity to this answer. In the southeastern U.S., there is some good work that shows growing cover crops in rotation can provide yield increases (especially if you are rotating crop species — legume covers with grasses, grass covers with legumes). Remember though, that cover crops grown in the Southeast have a much longer growing period than cover crops grown at more northern latitudes. In the Midwest, the yield benefit of cover crops to primary crops is not as consistent. We can find publications where yield increases are reported and others where there is no yield benefit (occasionally there is even a yield drag). When cover crops are grown is important. Cover crops grown following wheat (more of an Eastern Corn Belt strategy) have a greater probability of providing a benefit than a cover crop that’s grown following a soybean and corn harvest (which becomes even more true as one moves further north). I would recommend consulting local extension personnel or retail agronomists to get guidelines on the right cover crops for your area, and more importantly how to manage them. If you would like to have your question answered by Dr. Mullen, send us a tweet and we’ll get back to you! Q: What field conditions are most likely to distort potassium plant availability? A: The two biggest factors that affect potassium availability are soil moisture level and soil pH (assuming there is an adequate supply on the soil exchange sites, which are measured through soil testing). Slower diffusion rate due to limited water (potassium is just unable to move easily to the plant root). Poor potassium availability due to clay collapse (exclusively for 2:1 clays — smectite, illite, etc.). It is quite common for potassium deficiency to be noted much more frequently in drought stress environments, especially on heavier clay soils. The lower the soil pH, the more limited the availability of potassium. This is not necessarily due to poor soil supply capacity, but more a function of poor root development. Remember, potassium is relatively immobile in soil, so anything that limits the root volume will likely inhibit nutrient uptake (this is true for other immobile nutrients as well). Poor root development is common on acidic soils (even more so when free aluminum is present). Soil calcium and magnesium level can also impact potassium uptake. Soils high in either or both can result in a higher potassium fertilization to ensure an adequate supply. The eKonomics Farmer Profile Series provides perspectives from farmers across North America, encouraging a peer-to-peer dialogue on all aspects of 4R nutrient stewardship. Our goal is to help to support farmers everywhere in ensuring and sustaining plentiful yields to feed the world’s growing population for generations to come. A bit about your farm’s history: Our farm was started by my great grandfather in the 1930’s and has been passed down through the family since. I was away from the farm for a few years and moved back seven years ago to work part-time on the farm and take over the cattle side of the business, where we have about 60 head of beef cows. My father operates the row-crop portion of the farm. Years in business: The farm has been in business for more than 75 years. The land on our farm consists mainly of rolling hills. 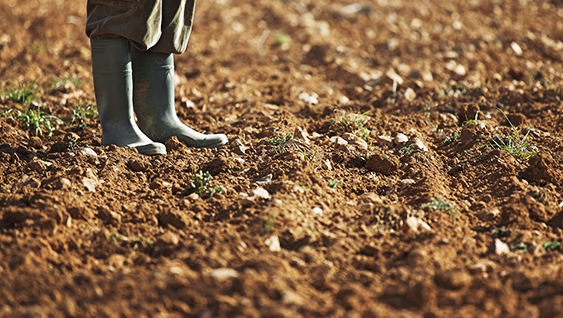 Because of our location in Western Kentucky, our soil is fairly fertile and topsoil runs pretty deep. Our nutrient application practices focus on the rye grass and wheat we raise for hay, as well as the fertilization of pastures every year. For me, the best part of working on our farm is the gratification that comes from raising an animal from birth and seeing it grow throughout its life cycle. I’ve enjoyed working on the farm since I was a kid spending time in the fields with my dad, and I continue to enjoy day-to-day activities such as driving a tractor, working on a fence, etc. We work very closely with our local ag retailer to make decisions regarding nutrient management. I rely on them to keep up on the latest nutrient management research, news and practices so I can focus on everything else. They have done a lot for us in the past related to seed, fertilizer and other input decisions. We also make sure to soil sample at least every other year. Given the various fertilization options, what application processes do you incorporate on your farm in terms of rate, placement, timing and nutrient source, and for what reason? Again, we work closely with our ag retailer for nutrient application, as they determine the best application processes and also perform custom application on our farm. We broadcast fertilizer with variable rate application and have done some grid sampling in the past. As far as timing goes, we usually apply whenever Mother Nature allows for it. Dr. Robert Mullen’s in-depth analysis of the 2015 soil test levels in North America issued by the International Plant Nutrition Institute (IPNI) reveals a decline in nutrient balance trends as more Kentucky soils test below the critical level for K and P. Given that information, what are you observing in your region of the state that conflicts with or supports that information? Over the years, we have continued to increase application rates to account for increased yields and subsequent higher nutrient removal. On pastures, we increase rates every third year and use a maintenance approach the other two years to control costs. On the row crop ground, we plant corn every year that we chop for silage and plant rye grass that we harvest in the spring for hay. There is a significant removal of plant residue and we recognize that we need to account for the nutrients that are lost. The natural output of our farming practices means we are taking more than we are leaving and we have accounted for that through increased applications. Be patient. It is important for farmers to take their time and avoid trying to do too much at once. This comes from personal experience, as I have attempted to perform 40 years worth of upgrades on our farm in just five or six years. Examples of upgrades we have focused on include updating the fencing on our cattle farm and enhancing conservation practices. While these upgrades will be beneficial in the long run, making things easier on both us and on our animals, they can be overwhelming at times and require patience to complete. Appreciate the opportunity you have been given. New farmers are rare and it is a hard industry to get into, so don’t take this chance for granted. Q: What time of year is best to apply K? A: There is not really a best time of the year to apply K. The goal of fertilization is to ensure that adequate K is available within the soil to supply plant nutrient demand, so timing is not especially critical. There are, however, a few exceptions to this general rule. Ideally, coarse textured, sandy soils that are subject to leaching and high rainfall should have K applications postponed until close to planting and establishment. Crops that have high K demand during certain development periods, such as cotton during boll fill, can also benefit from delayed timing closer to peak demand. Q: Will K applied to my field change my pH levels? A: Potassium application will not change the pH of your soil. Soil pH is an important soil characteristic to manage because low soil pH can affect root growth. Poor root growth can translate into many nutrient deficiency issues, including potassium deficiency. Q: Can I apply K with other fertilizer or do I lose the benefit provided? A: From a crop nutritional standpoint, no. Mixing K with other fertilizer materials will not impact the benefit of K fertilization for a crop, as we do this all the time with dry fertilizer blends. From a blending standpoint, there are certain compatibility issues to be aware of because mixing certain fertilizer products with K may impact fertilizer application and storage. For example, potassium chloride (MOP) and urea can be blended, but anything other than short-term storage of these two products together can result in caking due to the hygroscopicity (water sorbing) of the products. Consult your local agronomist or fertilizer retailer to make sure products are compatible before finalizing your application plans. Q: My soil test shows adequate K levels. Is there still a benefit to apply any this year? A. There are a couple of good reasons to consider applying K if your soil test level is considered adequate. 1) There is value in maintaining your current soil test level, so applying a maintenance rate of potassium fertilizer will allow you to do that. This even applies to high soil test levels, but obviously the higher your soil test the less likely you are to see a response to fertilization this year. 2) If your soil test level is very close to the critical level established for your state/region, applying K will ensure that more of your production area is at a level to support maximum production. Remember, a good soil test is a representative average of the area you plan to seed to a crop, and if the average soil test is near the critical, you likely have areas that would be considered low. My video that discusses the reason to apply maintenance applications of K may also help you out. If you would like to have your questions answered by Dr. Mullen, click here. Q: My soil test shows I am low in both P and K and I only have money to fertilize with one. Which do you suggest would be most beneficial to my crops (corn / beans)? A: While, ideally, you should apply both nutrients if they are limiting production based upon soil test, there is some research to suggest that just applying K can be more beneficial than just applying P if both are limiting. Also, check out our latest video which uses our Nutrient ROI Calculator to show you the dividends you can reap with an investment in both P & K.
If you would like to have your questions answered by Dr. Mullen, click here or send us a tweet (@ekonomics_PCS). The eKonomics Farmer Profile Series provides an inside look at farms across the US, sharing a peer-to-peer perspective for eKonomics readers. These profiles showcase the efforts of farmers nationwide to ensure healthy, plentiful yields in order to feed the world's growing population. A bit about your farm's history: My husband, Tyler, and I began our farm with just two acres of pumpkins in 2002 and have since expanded to two farms with more than 200 acres of farmed land. We run a diversified operation that includes a vibrant u-pick operation, large wholesale pumpkin segment, an agri-tourism partnership and commodity acreage. What's the best part of being a farmer, in your experience? The best part of being a farmer is loving what I do and striving to grow quality produce for our family, friends and customers. As a u-pick operation, we have the opportunity to talk to every family that comes to our farm and show them how we grow our crops. Farming appears to be simple, but in reality it requires so much knowledge about a wide variety of subjects. It’s challenging and rewarding on a daily basis, and never boring. Tell us how correct fertilizer usage has positively impacted your business? Have you seen a correlation between fertilizer usage and your bottom line? Fertilizer is critically important to the quality and yield of our produce. Without fertilizer, the plants would not have the necessary nutrients to produce the best quality and yield. Ultimately, that is what we are looking for – the combination of high quality produce and maximum yield, and fertilizer is a key player for this outcome. What is your primary source of information for making decisions related to fertilizer use? We take soil tests on each field prior to planting to determine the current nutrient levels. From there, we work with our local retailer to determine the necessary application of nitrogen, phosphorus, potassium and other micronutrients. We follow best management practices and the 4R Stewardship framework of applying the right fertilizer source at the right time, right rate and right place. We are stewards of the land and are doing the best we can to produce a high quality crop, while protecting the environment. Please share with us your fertilizer applications process. 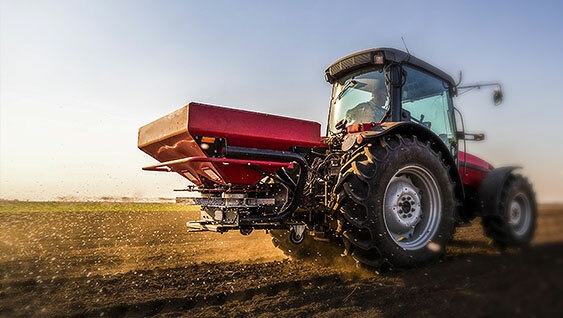 Providing nutrients to our crops requires broadcast spreading of pellet fertilizer prior to planting, as well as fertigation throughout the growing season. Fertigation is the process by which the water soluble fertilizer is combined with water and delivered to the plant roots through a drip irrigation line. Farming is a constantly evolving business, so I am sure it will change in the future. With three young sons, our long-term plan includes eventually expanding the acreage of both strawberries and pumpkins. I am most proud of the efficient farming practices and quality of our crops. That’s why we enjoy talking to all our customers that come to the farm and showing them how crops are grown. For example, we spend time during strawberry season talking about drip irrigation and soil nutrients, and time during the fall explaining the importance of honey bees (pollinators) and disease pressures. As an individual, I can’t control everything e.g., the weather. I must spend my time minimizing risk in all areas and control only what is possible. Smart and consistent fertilizer practices, help me to do this. What advice would you give to a new farmer? 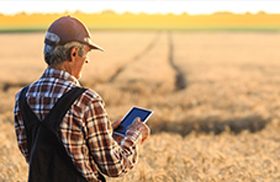 Be innovative and think outside the box, but use your resources such as the older generation of farmers, retailers and Cooperative Extension professionals. 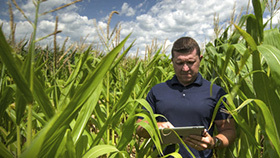 Farmers are needed in communities across the country – farmers that use a wide variety of skills including agronomy, meteorology, customer service and mechanics to produce crops. With the world population expected to reach 9 billion by 2050, food production is critical to not only health, but stability around the globe. What will your farm be like in ten years? This is a tough question, but I hope we will still be producing high-quality strawberries and pumpkins with a large wholesale and u-pick operation for each season. I imagine technology, as it relates to seeds, fertilizers and crop protection tools, will continue to increase our efficiencies and will play a large role in our farm’s future. 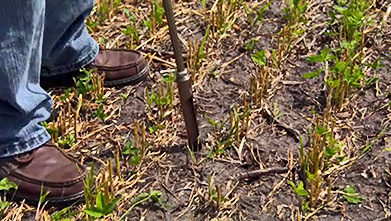 Soil sampling to determine nutrient status is one of the most economical management practices for crop production. By understanding your crop nutrient status you can better determine how much P, K and lime should be applied this fall to prepare for a successful crop next year. However, the first step is conducting your soil sample the right way. Make certain that soil probes and plastic buckets are clean prior to sample collection. Using contaminated equipment can alter soil test information. Collect a minimum of 15 random soil samples from a representative area to create a composite sample. Collecting too few samples can cause inaccurate information and poor repeatability in future years. Collecting samples at too shallow of a depth may cause nutrient concentrations to appear higher than what they really are, and sampling too deeply can cause nutrient concentrations to appear less than what they really are. Thoroughly mix your samples in a clean bucket before collecting the grab sample that will be submitted to the lab. The total amount of soil that is actually analyzed is small, so a poorly mixed sample can cause significant variability. For more on these tips, click here for a video from Agronomist Robert Mullen and Iowa State Professor Antonio Mallarino. A bit about your farm's history: A family farm since 1913, I am the third generation that has raised corn and beef cattle here. My son, who represents the fourth generation, just started farming this spring. Years in business: I have been farming for more than 37 years. What’s the best part of being a farmer, in your experience? Knowing that the work I do to grow food improves the lives of people all over the world. Maximizing fertilizer use has increased production since I started farming. 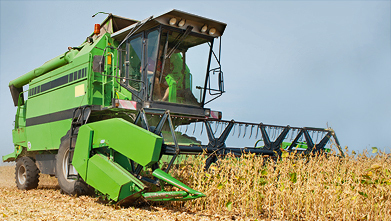 Accurate timing and placement of inputs help create a more efficient use of natural resources. I use two different Ag retailers in my area. The agronomists that I use make recommendations based on University research and their companies’ test plot results. We have used liquid cattle manure to fertilize about 40 acres of corn per year. We have not added any additional P or K for about three years on that field. We also rotate the fields so we can maximize the fertilizer value. On the rest of the corn acres, we apply anhydrous ammonia in the fall at a rate of 160 to 200 pounds of N, depending on yield goals and soil type. We have also experimented with two and three split applications of N in the spring with pre-plant and with sidedress application of liquid N in the summer. As the opportunity arises, we will expand. That it has been a family farm for more than 100 years and has nurtured the growth of multiple families. Learn from your mistakes and preserve the land that we are blessed with caring for. Observe your neighbors and ask lots of questions. What will your farm be like in 10 years? Information will be key in the future. We will be using more information technology to continue to improve yields and preserve our natural resources. A bit about your farm's history: Our farm was settled in 1867 by my great-great-grandfather. We have steadily evolved over the years, going from a joint livestock and grain operation to strictly growing corn and soybeans. Years in business: I returned to the family farm 14 years ago. The best part of being a farmer is participating in a profession that is meaningful. It feels great to make a living contributing to society by providing a safe and abundant food source. Correct fertilizer applications become more and more important all the time with shrinking margins and nutrient management concerns. Being more precise in our fertilizer usage allows us to be more efficient with our resources, helping the bottom line while growing more with fewer inputs. We regularly soil test and keep up-to-date yield maps. We use the data compiled over the growing season to adequately assess where we need to fertilize and to what extent. We discuss this with our application company that puts the information into a digital format. This information is then used for variable rate applications. We have also experimented with a strip-till system and had some good success in the process. Hopefully, but with the downturn in prices, already tight margins are not looking good right now. We may be in a period where we have to weather the storm for the time being so that we can emerge stronger and then continue expanding. The longevity over five generations. I've learned to not get overly excited when things are good and likewise to keep my head up when things are bad. Farming can be a roller coaster and you need to keep an even keel. Have fun and enjoy a challenging but rewarding life. Dr. Mullen talks to Farm Talk Radio about how starter fertilizers can make all the difference this spring planting season. 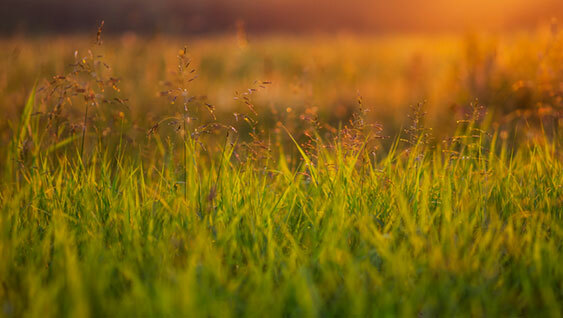 Due to a prolonged winter with cold, wet conditions still plaguing much of the country, many farmers have been forced to delay spring planting until conditions improve. 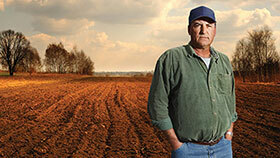 Delayed planting may cause a farmer to reconsider their options, and good decisions now can pay off at harvest time. 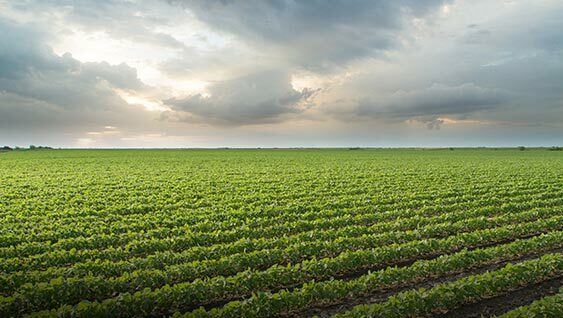 Dr. Robert Mullen, Nutrien's Director of Agronomy and eKonomics contributor, has prepared several tips to aid farmers in taking advantage of every potential opportunity to maximize their yield. Don’t underestimate the value of starter fertilizer, especially in northern areas of the Corn Belt and in conservation tillage systems. 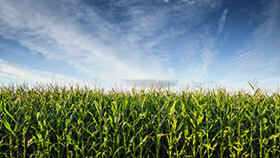 Starter fertilizers help the crop get off to a fast start and reduce the risk associated with a short growing season. Position yourself for success by implementing an effective fertility program regardless of planting date. Properly fertilize your crop initially and reap the benefits throughout the growing season, as the proper balance of nutrients will improve the potential for a healthy, profitable yield. Don’t rush to plant in fields that aren’t ready. Although it is tempting to get seeds in the ground early, it is important to remember that planting in unsuitable conditions can lead to problems in a crop’s growth cycle, such as poor root development, which will ultimately decrease your yield. Do not necessarily alter seeding rate. Data suggests that sticking with what you have previously planned is the best approach, but using a slightly lower seeding rate is acceptable if adjustments must be made, especially when soil temperatures have increased. It is not necessary to change hybrid maturity or soybean variety to a shorter season option. This should only be considered at higher latitudes, or if the planting date is extremely late. In every line of business, there’s some kind of metric or standard used to gauge performance. 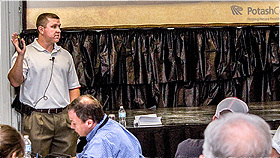 As we look ahead in 2014, what benchmark goals would you like to achieve for your ag business? These three steps can help you determine and ultimately achieve your financial goals on the farm this year. Step 1. Set a Key Performance Indicator (KPI). In order to track progress, a goal has to be measureable. The first step toward achieving any goal is to decide on what you should measure and how you will measure it. Financial KPI examples for your farm may include operating profit, farm working expenses, operating return, return on equity, growth in equity and discretionary cash. Step 2. Make the KPI known and relevant for your team. Next, make sure your team is aware of each KPI and understands its importance to your business. Then, create specific tactics and actions that will help you to achieve those KPIs. Step 3. Measure against the KPI and evaluate your performance. Simply tracking a goal doesn’t provide you with a full picture. It’s important to evaluate and analyze your data, as it can help uncover opportunities for improvement. As we’ve said before, having better information enables you to make better decisions, and ultimately leads the way for a strong year in 2014. Be sure to use several of the tools on this site, to help you achieve your financial and performance goals this year. What Key Performance Indicators (KPIs) are you planning to track on your farm in 2014? Send us a Tweet at @eKonomics_PCS to share! Adding more acres is often how you think about growing your farm. Just remember, there are other ways to grow. In a recent article from Successful Farming, industry players discuss a variety of ways to create growth opportunities for the future, with the land you have now. In addition to using a variety of ROI tools to help make smart fertilizer decisions, Successful Farming suggest three alternatives to grow without adding acres. Consider a broader set of business options, including acquisitions, partnerships or other arrangements. Be open to ideas that can provide growth opportunities. Having a 16-row planter as opposed to an eight-row planter helps ensure timely planting in a spring interspersed by rain showers. In a normal year, though, large planters can represent excess machinery, particularly if you farm on a smaller scale. If that's the case, custom farming may be one way to use excess capacity. Custom farming can also be an option if you have other implements with larger capacity than you need in most years, such as a sprayer or combine. One expert recommends buying land with inherent productive ability and then upgrading it. Making an early investment can lead to a solid return in the future. Growth is more than buying another farm. 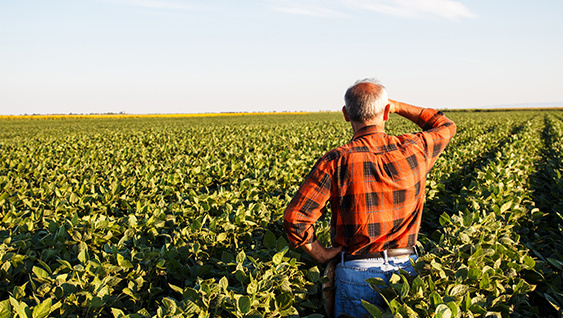 Beyond adding additional acres, think proactively about ways to grow your own farm operation. Follow us on Twitter at eKonomics_PCS to share ways you’re expanding your farm using the hashtag #ekonomics. Dr. Mullen talks to Brownfield Ag News Radio on how farmers can achieve the ideal soil sample. For more info on this topic check out the video here. With this year’s drought-induced poor yields, many farmers may have the temptation to assume the majority of crop nutrients they put in the ground are still there. Dr. Mullen points out that may not necessarily be the case.